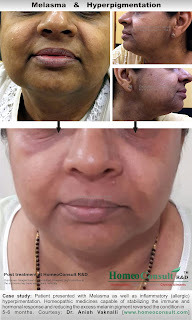 Melasma or Chloasma is a dark skin discoloration which can affect anyone, especially common in women, during pregnancy and those on contraceptives or hormone replacement therapy (HRT) medications. It can affect men as well as women, and may occur on the arms and on the face. Melasma is characterized by dark, brownish or tan, irregular well demarcated hyperpigmented patches commonly found on the upper cheek, nose, upper lip, and forehead. Besides the patches, melasma does not cause or indicate any serious medical ailment. Stimulation of melanocytes or pigment-producing cells results in production of melanin pigments when the skin is exposed to sun. There is a genetic predisposition to melasma. Conditions which trigger Melasma include: Pregnancy, hormonal contraceptives, sun exposure, allergies to soaps and cosmetics, and thyroid disease. 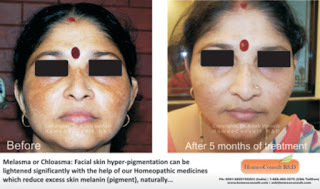 Melasma is not just an external skin disorder. As mentioned above, numerous factors affect and predispose an individual to develop this condition. 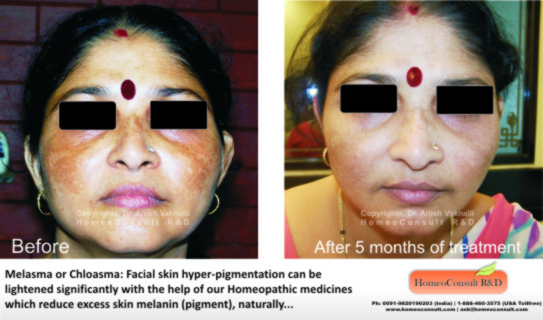 Homeopathic medicines have the ability to minimize this tendency and helps in normalizing hormonal fluctuations and allergic reactions thereby indirectly preventing over stimulation of melanocytes responsibe for skin discoloration. Besides rectifying this inherent tendency, we have also found a handful of remedies which help in lightening the skin when used over a period of 4-6 months. Most Homeopaths tend to prescribe specific remedies such as Sepia and Thuja which more than often do not yield results. There are over 20 remedies which can be used and only an experienced Homeopath can ascertain the right remedy for you. Kindly abstain from self medication as you may end up worsening your condition as well as waste the initial crucial period when our remedies work their best. If you or someone you know suffers from skin problems we strongly recommend that you start homeopathy as soon as possible.